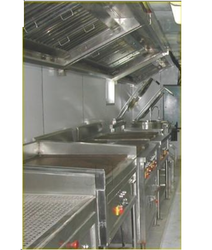 We offer a wide range of very high-quality Fire Suppression Commercial Kitchen Exhaust Hoods With Baffle Filters to our most reliable customers. These products are available at a very affordable market price. These products are available in various sizes. These products can also be customized according to the requirement of our clients. We believe in effective and timely delivery of product once ordered by our clients. Ansul R102 liquid agent connected with Auto manager system manages all functions to suppress wild kitchen fire. Soft metal fuse is connected to Auto man which spills Liquid and then water and shuts gas pipeline nob to suppress the fire. SS nozzles are installed at a variable distance as to ascertain future changed of kitchen equipment below the hoods. 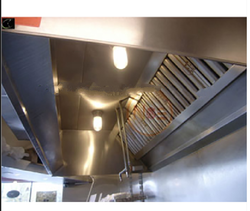 We offer a wide variety of high-quality Stainless Steel Kitchen Exhaust Hoods With Baffle Filters to our customers. These products are offered with high-quality stainless steel baffle grease filters with oil dip removable tray installed at 45 deg for total exhaust eviction. These products are provided with safety grids which comply with the standards in force. These products undergo various quality tests at each level of its production to ensure superior quality and flawless performances. We offer a wide range of very high-quality Stainless Steel Kitchen Exhaust Hood with Baffle Filters (Wall Hinged) to our most reliable customers. These products are available in various sizes. These products can also be customized according to the requirement of our clients. We believe in effective and timely delivery of product once ordered by our clients. These products are manufactured using very fine quality raw materials that are sourced from very reliable vendors. These vendors are associated with us over a very long period of time. These products are available at a very affordable market price. Looking for Kitchen Exhaust Hoods ?